A question for you that I’ve been pondering lately, more philosophical perhaps than tied to any particular player or team: The top scorers in the big leagues last season got 31, 31, 22, 20 and 26 goals (ENG, SPA, ITA, GER & FRA, respectively). The players with the most assists, on the other hand: 13, 17, 10, 13 & 12 assists. The trend holds up in the CL as well (17G/5A) and the EL (8G/4A). Why are there so few assists? I don’t know that we even have to get into the whole thing of what’s more valuable, goals or assists (my gut tells me ~equal as both leads to a goal). Messi is a goalscoring machine around whom Barcelona is constructed, so fine, I get why he doesn’t notch up 25 assists. Same for Ronaldo, they’re top predators and finish moves instead. But I watch a guy like Juan Cuadrado and part of me is disappointed in him because he doesn’t combine his physical and technical skills and advantages to get 15 goals and 15 assists in a season. He absolutely has the skills to get to 15 assists in 38 games, so why doesn’t he? Why does barely anyone, or am I being unreasonable? I could spit out a few theories as to why this is (assists more open to interpretation and less binary than goals which either are or aren’t, etc), but I’m not convincing myself fully. This struck me as weird a year ago, so I put quite a bit of thought into this when I first started doing research and came up with two answers I think make some sense. 1) Sequences of play. Why doesn’t every shot have a pass attached to it? Because sequences are broken up. Tackles, recoveries, bounces off a defender, off the post, off a goalkeeper save etc all end up yielding shots too. Thus you end up with guys who average 5-6 shots per game at the top end, while you only get 3-3.5 key passes a game for top creators. 2) The second problem can be summarized as: Calculus is hard. Doing it in your head, on the fly is really hard. Getting a shot off is a physical act, but it’s moderately simple overall. You need to take whatever direction the ball is currently traveling, and change that toward the goal. Yes, you have to beat the keeper and potentially a defender, but it’s not that hard. Now think about what has to happen to pass the ball so that someone else can get a shot. How many defenders are involved and how do you make sure only your teammate can collect it? How fast is your teammate moving? Do you have to weigh the ball so that the keeper can’t collect it? Which side does your teammate prefer to shoot from? Does the pass need to be in the air? Popped over a defender’s foot briefly and then on the ground? Things are not moving in straight lines! Curves and velocities are involved. Also, and this seems important… you aren’t in control of any of this. Think about when you are playing FIFA and the computer-controlled teammates just do dumb things. Now consider that many football players, though quite physically talented, are not particularly bright. You don’t control them either. It takes some level of faith and potentially hundreds of hours of practice time to understand where they are likely to be, and also to get them to understand where you want them/where they should be/run. In short, contributing a key pass is horribly complex. You are attempting to create the one act entire defenses are designed to stop (good shots), and they usually have more men in defense than you have in attack. Vision comes into play too, as seeing all defenders as well as potential teammates making runs and where they are making them to, is super important. Even with a lifetime of practice, football is an incredibly complex game, and passing through a defense is a far more complicated process than merely getting a shot off. So uh… that’s why I think we have so few assists and also why I think the ability to create key passes is one of the most telling traits when judging whether a player can be a successful attacker at an early age. I think Sky are starting to do this in their broadcasts, working in the occasional fact and then using it as a jumping off point for commentator discussion. This is awesome when it’s Gary Neville and Carragher chatting about it, but it’s preeeeeeetty bad when they shoehorn Glenn Hoddle and the donk squad in. Basically, you need bright commentators to make this stuff relevant and interesting. This is another reason why Sky’s Monday Night Football is the best football program on television. Another big key to wider acceptance is repetition and visualization (this is true on the internet as well). If you can convey information or tell stories through data vis, fans tend to be pretty responsive to it. It’s a tricky balance, and maybe the hardest part about it is finding people with the skills to do this in the modern world. Data vis guys are in super high demand across almost all industries. How do you evaluate versatile players that may not have a specialist position? This one is tricky because they definitely have good squad value, and managers love a guy that they can plug in for multiple positions who will perform. However, are those performances enough to justify them above guys who are specialists? One of the things I can now do with the data set I’ve been working with is positional filters, so we can look at how a player performed only in a specific position. The best example I can give is the breakdown I did of Emre Can when he transferred to Liverpool. Plug him into different roles and you get different output. From a data perspective this quickly becomes problematic because you end up with smaller and smaller samples, but if you want to buy a player, it’s certainly something you should spend time doing. Anyway, my thought on this is that you get bonus points for versatility, but it doesn’t overcome average stats. 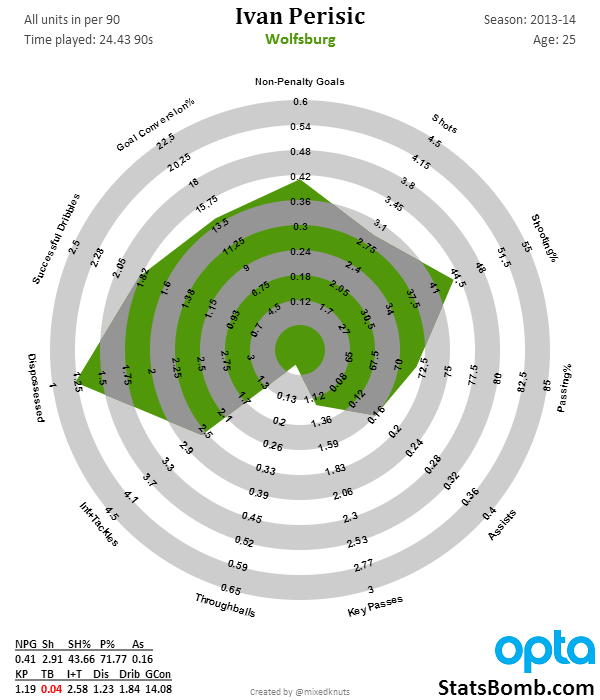 A guy like Can is interesting at both central midfield and left back based on his stats output. The fact that he can play both makes him more valuable, but not enough that you’d buy him if he were merely average. I like them as an additional evaluation tool. I think they are particularly useful in leagues where it’s hard to get granular data. Another place I think they might have good use is for central defenders, who are extremely difficult to evaluate via stats because they are closely tied to team tactics. Finally, I think Jorg’s stuff is probably solid at picking up youth players teams should be interested in, and who deserve more scouting. Since that’s also super valuable information to have, I’d almost certainly use it if I were in charge of player scouting at a football club. I picked up on that too, but looking at his league stats, I am merely whelmed. That’s epic. What happened in between? Y U Hate Perisic, Jurgen? Can Perisic grow back into that? He’s 25 years old now, so it seems unlikely. This varies based on how much a team needs English players (plays in Europe), and also how much extra marketing and interest boost you get from having one. Most small and medium-sized teams in England are still somewhat academy reliant, which means they get most of their English players outside of the major transfer market. What happens is, you end up with top teams competing for the very best English players, which adds transfer premiums to more transfer premiums due to rarity. For the most part, middling English players should have almost no premium, but the very best English players will have huge ones. Aaanyway… my guess on this is probably 25-33% makes sense, but in cases of luxury goods (which is what top, top English players are), you will tend to see a lot of variation. Defensively, he was second in the Eredivisie in possession-adjusted interceptions and tackles. 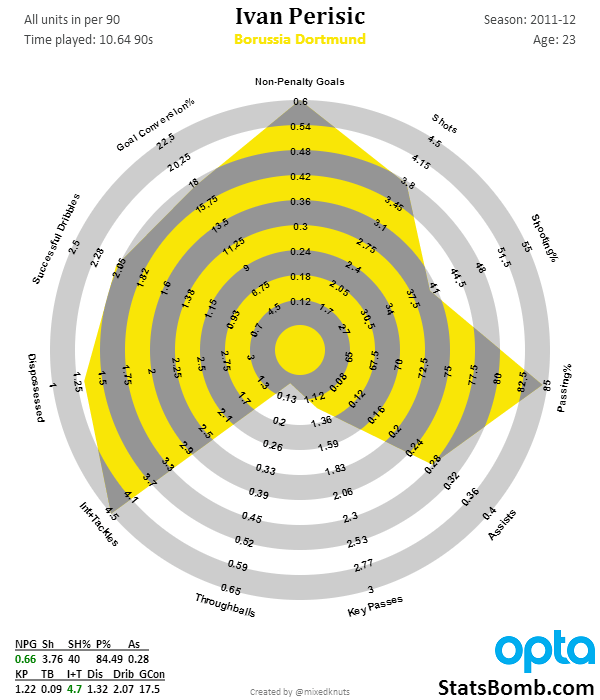 He’s got excellent passing range (a high passing percentage plus strong long ball numbers as well), makes good decisions, and contributes excellent KP numbers despite playing deeper positions. Watching highlights, he generally has good ball control, can dribble a bit, and looks strong. He also won the Eredivisie player of the year award this season, so we’re not just saying he looks solid in the stats. 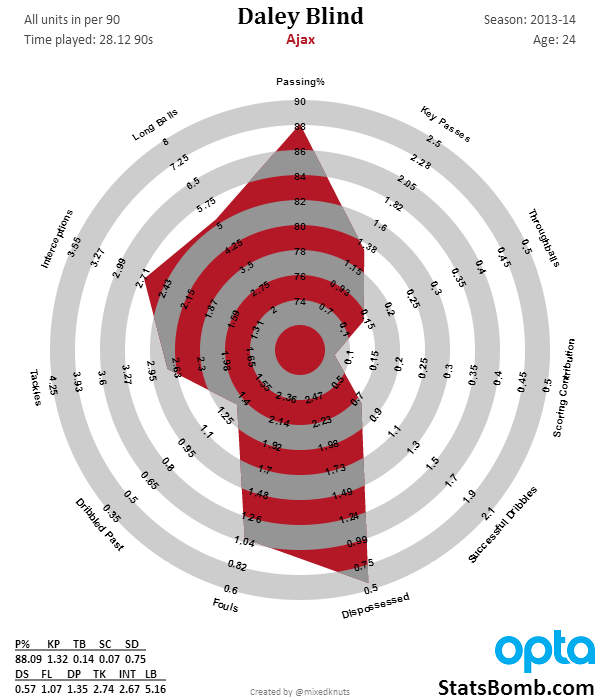 Stats and eyeball test both agree here – Daley Blind is quite good. At 24, he’s just entering his prime. There should be more to come.